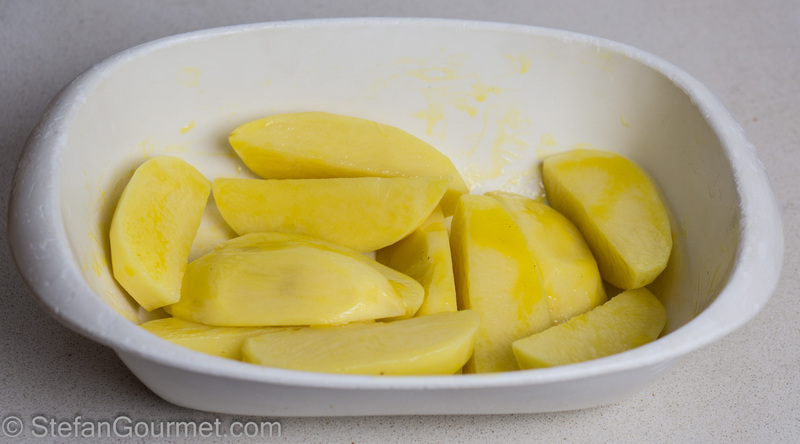 Preheat the oven to 225ºC/440ºF (fan forced). 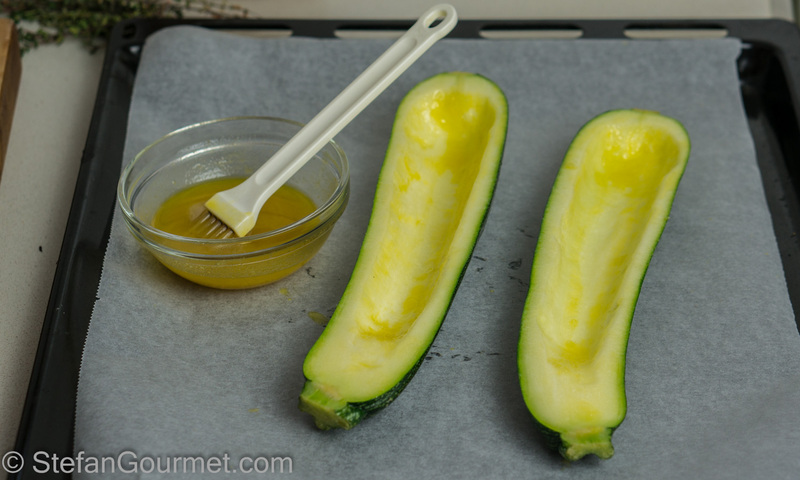 Cut the zucchini in half lengthwise and scoop out the seeds with a spoon. Reserve the seeds. 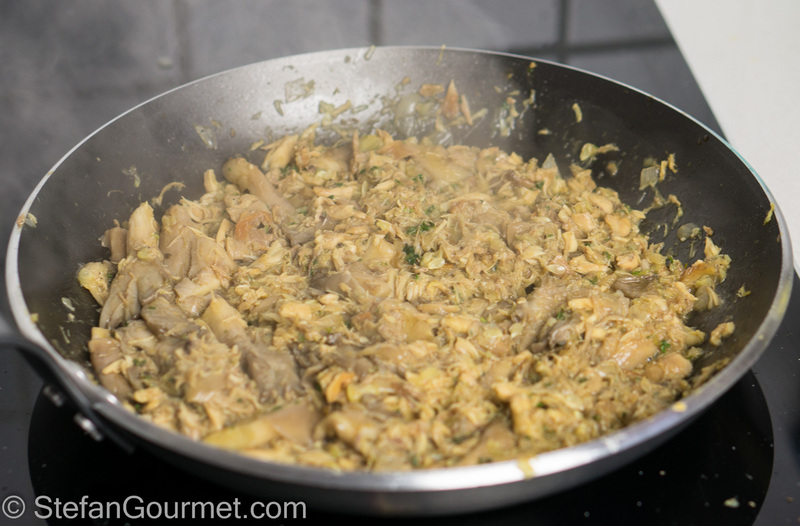 Brush the zucchini inside and out with 2 Tbsp of chicken fat. 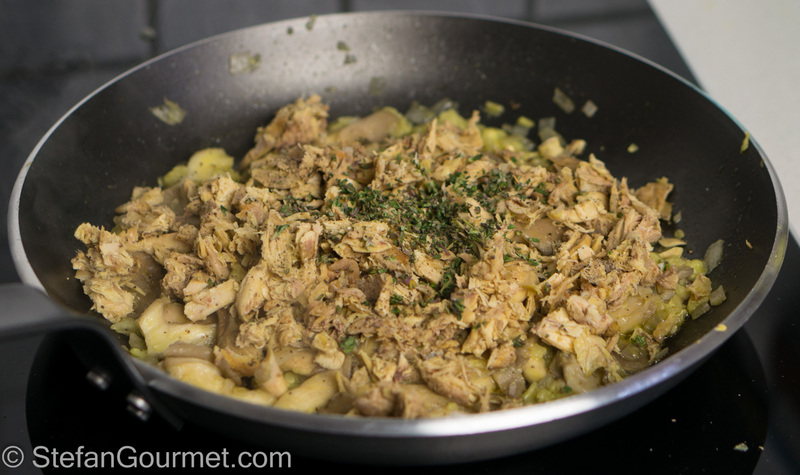 Peel the potatoes, cut them in quarters, and toss with 2 Tbsp chicken fat. 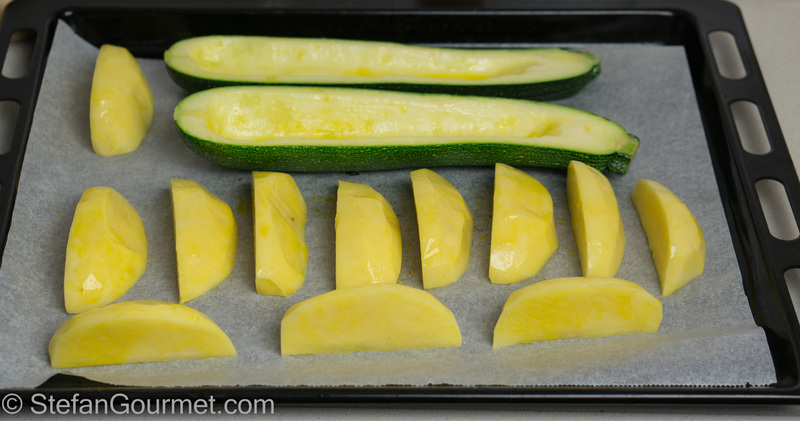 Arrange the zucchini and potato wedges on a baking sheet lined with parchment paper. 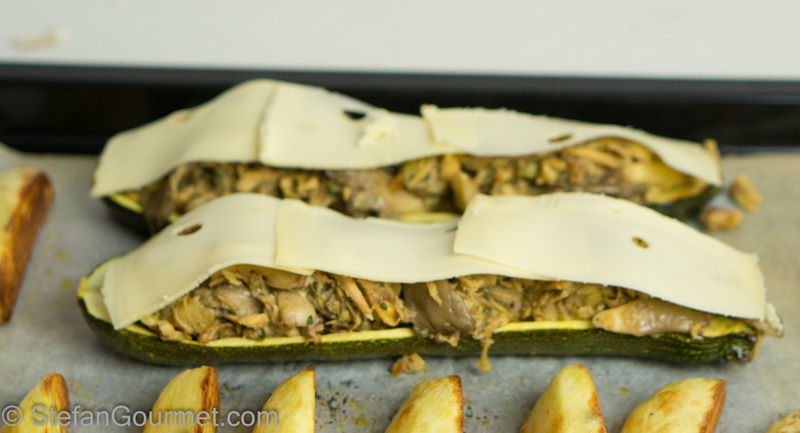 Roast for about 20 minutes at 225ºC/440ºF until the potatoes and zucchini are golden. 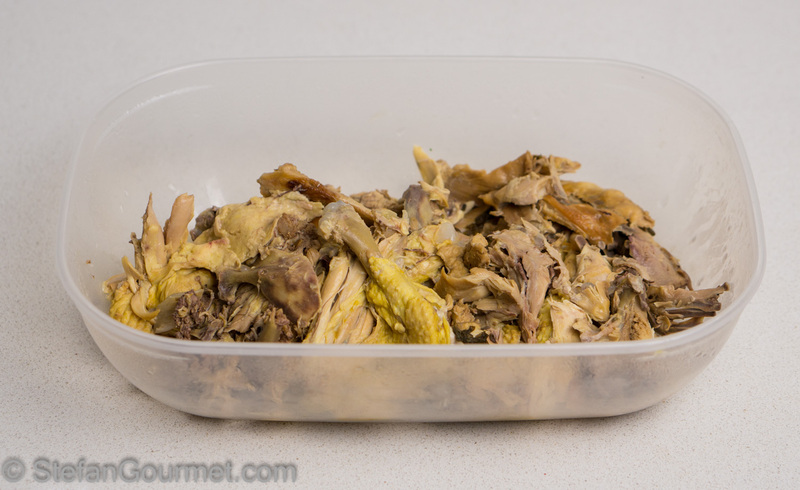 Meanwhile, heat the remaining 2 Tbsp of chicken fat in a frying pan. 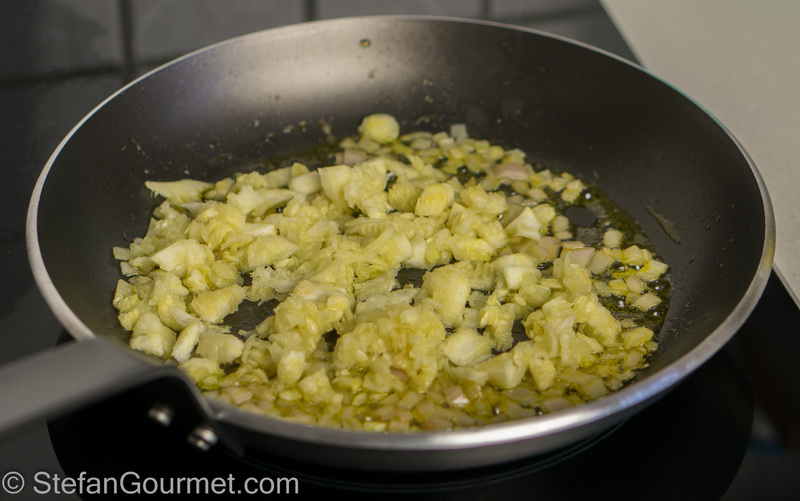 Add the shallot and sauté until translucent. 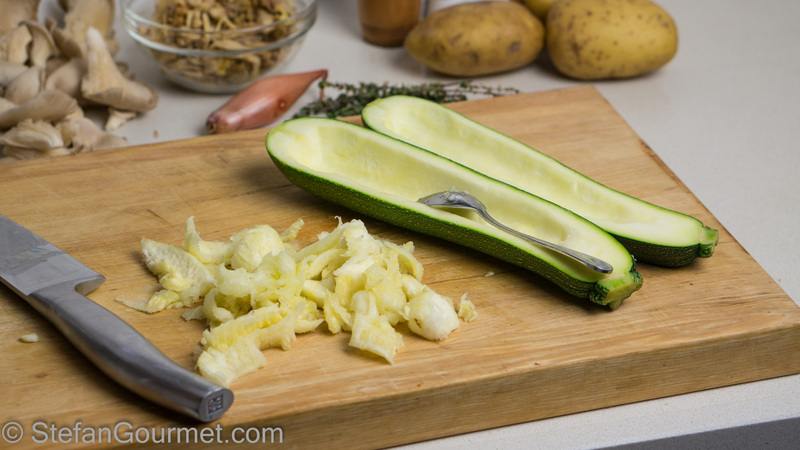 Chop the reserved zucchini seeds and add to the shallots. 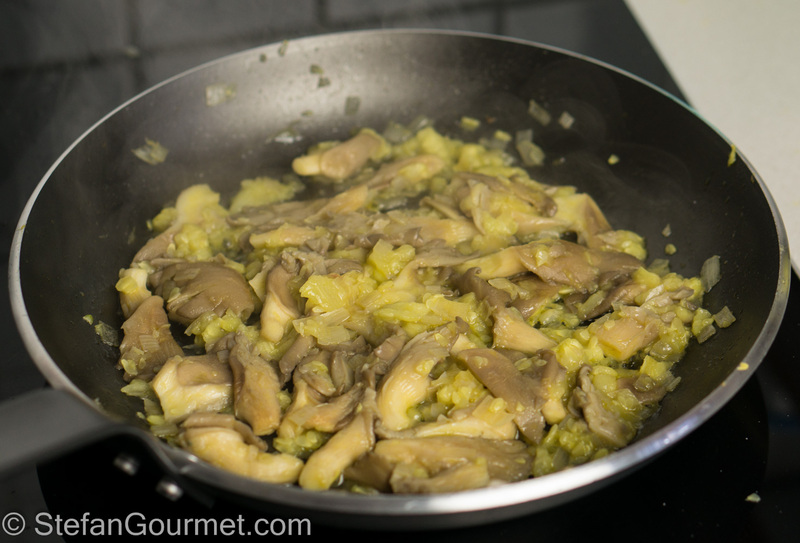 Add the sliced oyster mushrooms and season with salt. 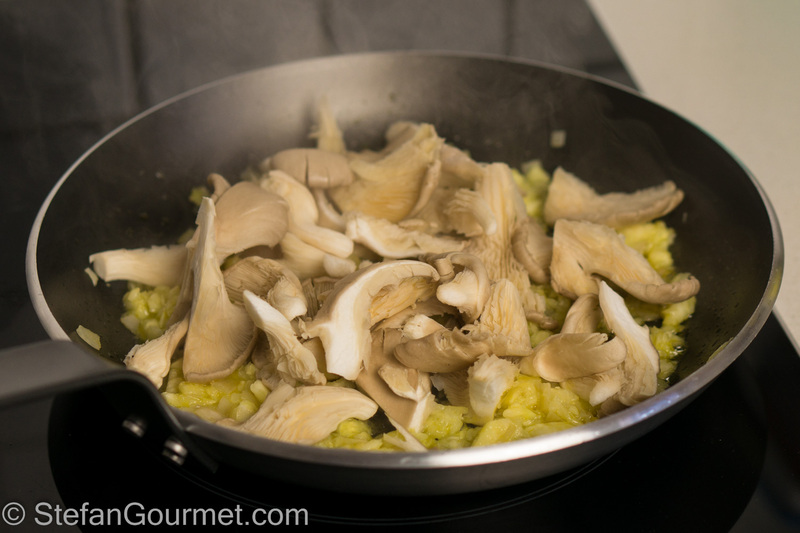 Sauté over medium heat until the mushrooms are cooked, about 6-8 minutes. 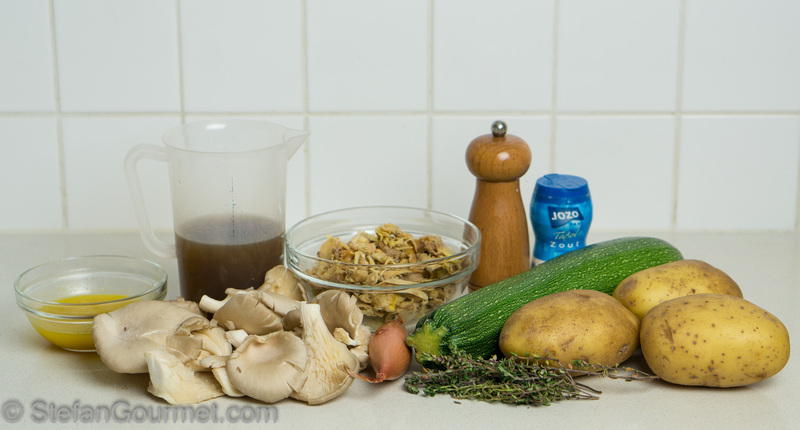 …and the chicken stock (which I had reduced separately, but that is not necessary). 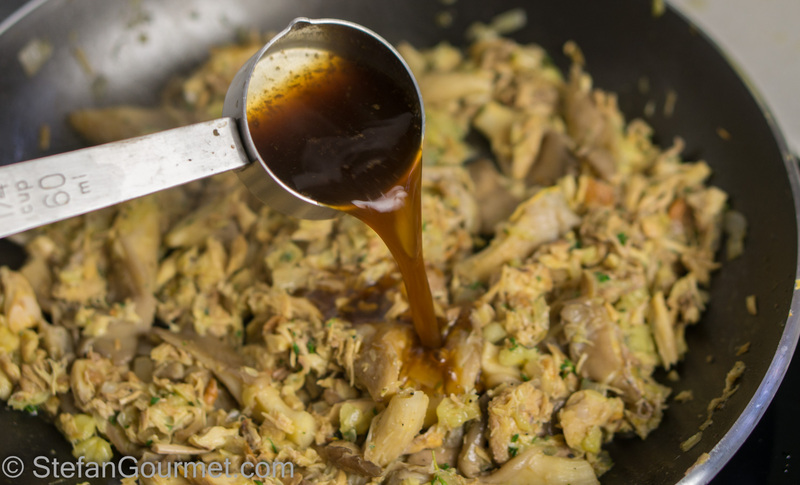 Cook over medium heat, stirring, until the mixture is almost dry (this will happen more quickly if you reduced the chicken stock separately). …and top with the cheese. Return to the oven until the cheese is melted and bubbly, 5-10 minutes. 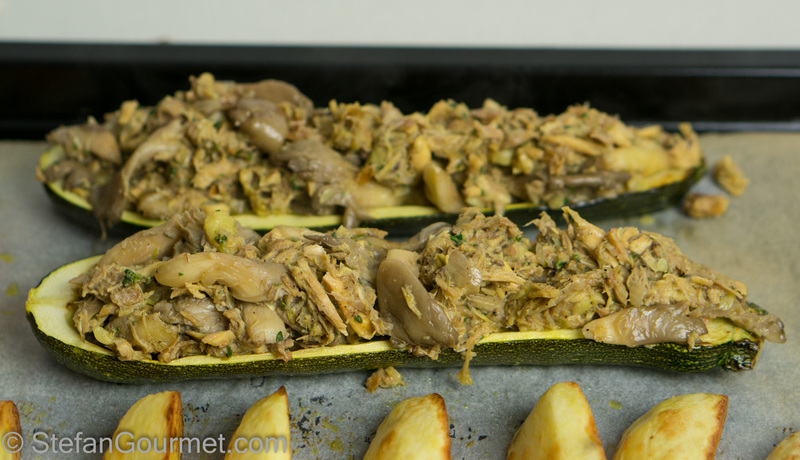 Serve the stuffed zucchini with the potato wedges. 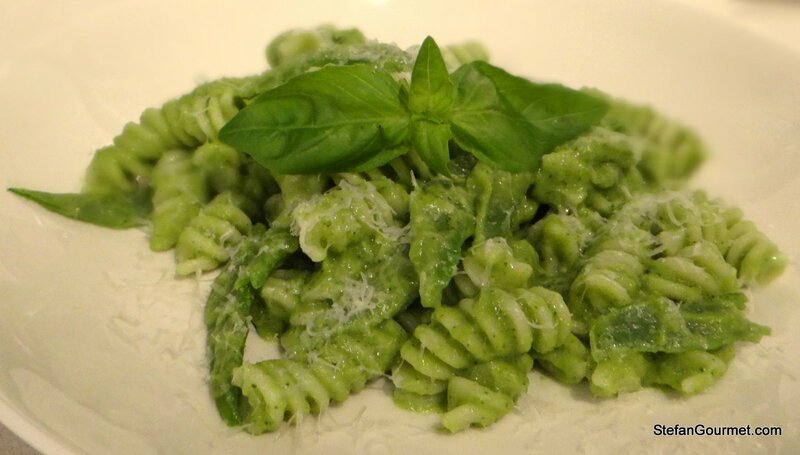 It is a coincidence that today’s flashback has a similar theme to Silva’s and Marina’s posts for today: fusilli with runner bean ‘pesto’. The main ingredient in this pesto-like sauce is the runner beans, with just a hint of basil and garlic to prevent overpowering the delicate flavor of the beans. Preparo le zucchine in tanti modo ma farcite così mai. Voglio provarle. 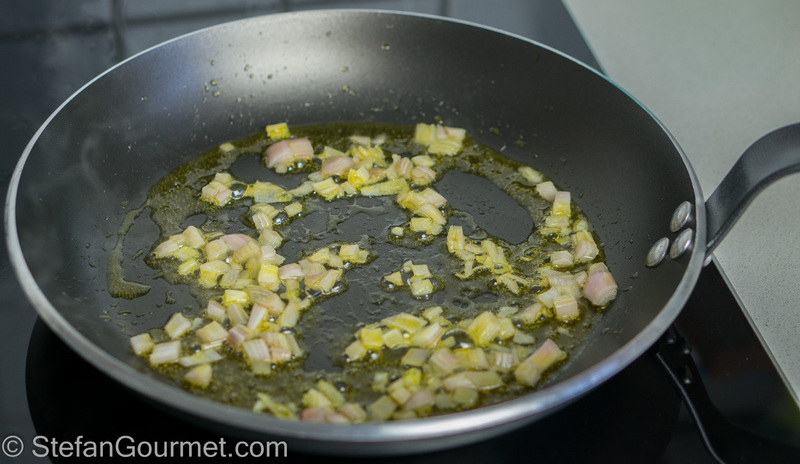 Devo dire che l’abbinamento è piuttosto inconsueto per la mia cucina. Di sicuro da provare! 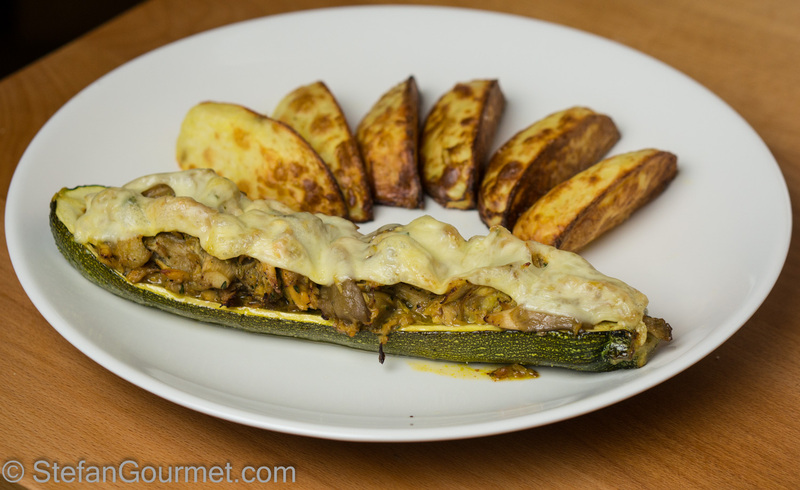 Love stuffed zucchini which I oft make with grains! 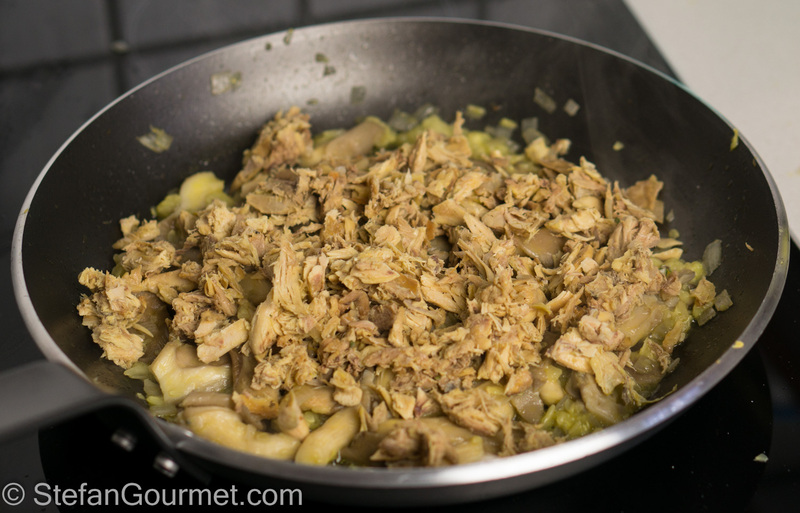 This is great since most have left-over chicken awaiting in the fridge only too often! Well, I can’t quite see the zucchini in the ingredients list, but then I did sleep but briefly last night and we know it is there 🙂 ! !